Baby Violet caught her parents by surprise by making an unexpected early arrival, but they still made sure she had all the makings of a beautiful room to come home to. Violet’s mum Vanessa did the brunt of her nursery decorating purchases from her hospital bed, all the while thanking the powers that be for WiFi and her iPad as she sourced inspiration from Pinterest and made her purchases. 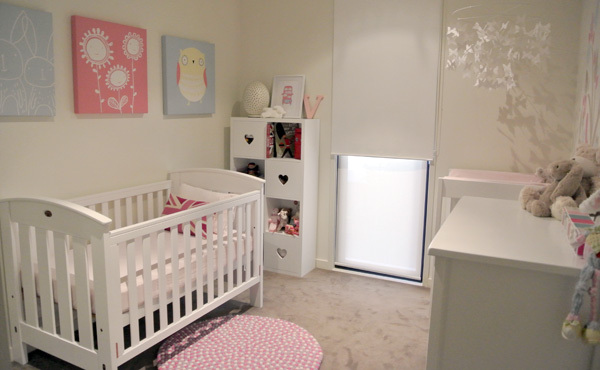 Vanessa writes: Violet’s nursery was not completed until she was about six weeks old as she arrived four weeks early. I finished work one day thinking I had four weeks to finish everything and was admitted to hospital the following day – so I organised the prints, decal and other bits and pieces from my hospital bed. I changed my mind so many times in regards to the colour theme and spent many hours on Pinterest searching for nursery inspiration as I wanted this to be a space where Violet could grow up in and not grow out of when she was no longer a baby. When I made the decision to purchase the Happy as Larry Marshmallow Felt Ball rug (which is the centrepiece of the room) this really set the colour scheme and I decided on a pastel theme – my ideas just evolved from there. Violet’s dad is from London and it was extremely important to me that this was reflected in the room, so you will see the British touches such as the pink Union Jack cushion, London Bus print and London books. Violet’s dad thinks her room is now the best room in the house! I absolutely loved decorating this room and is perfect for our little girl. We agree Vanessa, this room is a perfect space for Violet and we love the way it’s decorated using classic white furniture and adding fun details for sentiment. I’m particularly smitten by the Egg Lamp as well as the butterfly mobile and the enchanting shadows it sends dancing across the wall. I’ll be adding those to my decorating list!